On Tuesday, May 13, 2014 the p2PAC will be having a fundriaser at the Sharp Edge Bistro on Penn Ave downtown – more details about the event are at the bottom of this post. One of the projects outside of IheartPGH that I am most proud of being a part of is the p2PAC. For the most part I haven’t shared many political posts here on IheartPGH, so bear with me as I give a brief history of the p2PAC and I hope you will consider supporting the p2PAC at our first big fundraiser on Tuesday, May 13.
p2PAC is short for Progress Pittsburgh Political Action Committee. A PAC is short for Political Action Committee, which is a type of fund that raises money for political candidates and issues. (If you are interested in learning more about how PACs differ from non-profit organizations – check out this webpage on that explains the types of organizations. In 2004, I quit my job at Carnegie Mellon to work on the presidential campaign. I had watched the documentary film The War Room which was about Bill Clinton’s first campaign. 2004 was in the days before Netfilx and streaming video, I had to track down and rent the VHS version of the film from Heads Together, which was Pittsburgh independent movie rental shop at the time. After working on the 2004 campaign, I met a ton of other Pittsbrughers who were interested in harnessing the enthusiasm around the presidential campaign to get more people voting in local elections. Each election cycle a group of supporters would come together to support a new candidate, and each election cycle would reinvent the wheel of building this community. But after election day there was no organization working to keep this community of civic minded Pittsbrughers together. The idea: create a year-round, sustainable organization of politically engaged Pittsburghers. The solution needed to accomplish three things..
was sustainable year round, something that could continue beyond one election cycle. After researching other organizations, such as EMILY’s List and the Sierra Club PAC, we decided to form a local Political Action Committee (PAC). Most large national advocacy organizations have PACs and we wanted to bring that model to the local level and raise money to support candidates around a set of values. 2009: Councilwoman Natalia Rudiak, Councilman Daniel Lavelle, Susan Banahasky, Judge Hugh McGough. 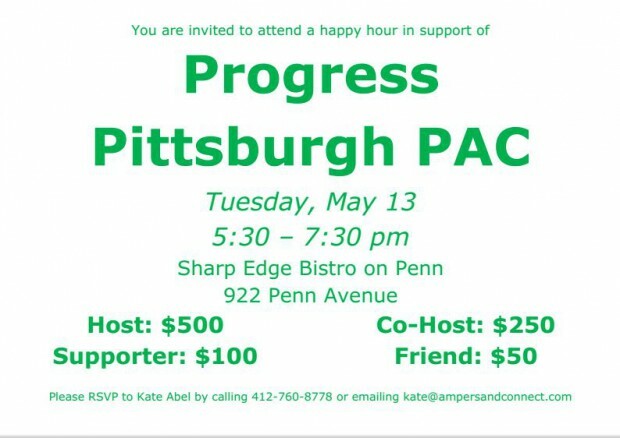 Please join me and the rest of the p2PAC board for a fundraiser on Tuesday, May 13, 2014 from 5:30-7:30pm at the Sharp Edge Bistro (located on Penn Ave Downtown). Contributions to the p2PAC can be made online here or at the event. The contributions amounts listed below are suggestions – if you would like to attend, please come join us at the Sharp Edge and learn more about the p2PAC! « Shop Late Night in Lawrenceville is Tonight!